Mark Verabioff is an artist. Team (bungalow) is pleased to present a show by LA-based artist Mark Verabioff. Entitled Poolside Drive-by, the exhibition will run from 06 January through 17 February 2019. Team (bungalow) is located at 306 Windward Avenue in Venice, CA. Long before the current administration’s ascendancy, the wheels had been turning in favor of hostile mechanisms of control. The blatant aggression and fascist broism of the present, however, have thrown into stark relief how identity and the gaze of another can be weaponized and internalized. Mark Verabioff’s practice is borne of the conjoined dynamics of identity and imaging and proposes self-definition as a position of resistance that can challenge cultural and political power structures. Existing at the intersection of autobiography and community, Poolside Drive-by is the mapping of an internal topography that tells us much about the artist’s choices and frames of reference, but also describes the kind of world in which he finds himself. Vulnerable, humorous, both reverent and irreverant, the work is grounded in Verabioff’s appropriative processing of cultural products and pushes against strictures of authorship, authority, and objectification. The show’s title, Poolside Drive-by, juxtaposes positions of blithe passivity and ruthless retaliation; when they go low, kick ‘em while they’re down. Grounded in an aesthetic and semiotic engagement with language and image, Verabioff’s practice finds enduring inspiration in Situationist tenets. The artist’s earliest works were in the medium of video, often utilizing a multi-channel format and balance of text and moving image. The sensibilities and possibilities of video remain embedded in Verabioff’s canvases and page tears, and in his role as editor, documentarian, and performer. Fundamental to the artist’s methodology is film’s potential to complicate and collapse temporal order, and its structural capacity to map out a configuration rather than sequential and linear organization. Evidence of this structural approach is further apparent in the artist’s mining of his own archive for fragments that are reconfigured and transmuted in new work. This recirculation of material builds a personal palimpsest through accrued layers of meaning ultimately descriptive of the artist’s identity, community, and body politic. The links between Verabioff’s distinctive and darkly farcical configurations of sourced material and quotations are not immediately apparent, implying that the personal associations of the artist are the structuring agent rather than any obvious affinity between media. The common denominator between Vanessa Redgrave, Stranger Things and the logo for seancody.com is the artist as aggregator and editor, autobiography as a filter for cultural artifacts. Verabioff establishes personal subjectivity as a locus from which to critique and subvert hierarchy and regimentation, offering him the freedom to hijack, recontextualize, and deconstruct material regardless of its birthplace or baggage. The essential foundation of Verabioff’s practice are his page tears, performative artifacts that become the material substrate for further edits and interventions. Digital material is also produced as a physical article, though the artist’s manipulation and editing uses the original tools and formats to directly implement his own agenda. The cumulative effect of this processing and imprinting is an inculcation or re-authorship, wherein the artist’s edits and interventions ingrain new meaning and recruit the material into his personal archive. Mark Verabioff was born in Kingston, Canada in 1963. He has been living and working in Los Angeles for the past 16 years. Based in New York until 2001, Verabioff regularly performed guerrilla art actions and screened single-channel videotapes in museums and not-for-profits throughout the city. 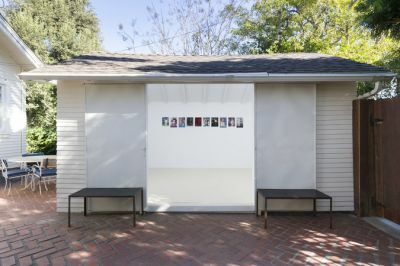 He was featured in the 2016 iteration of Made in L.A., the Biennial exhibition at the Hammer Museum, and it was this substantive appearance that galvanized interest in his work. This is Verabioff’s second exhibition with Team.